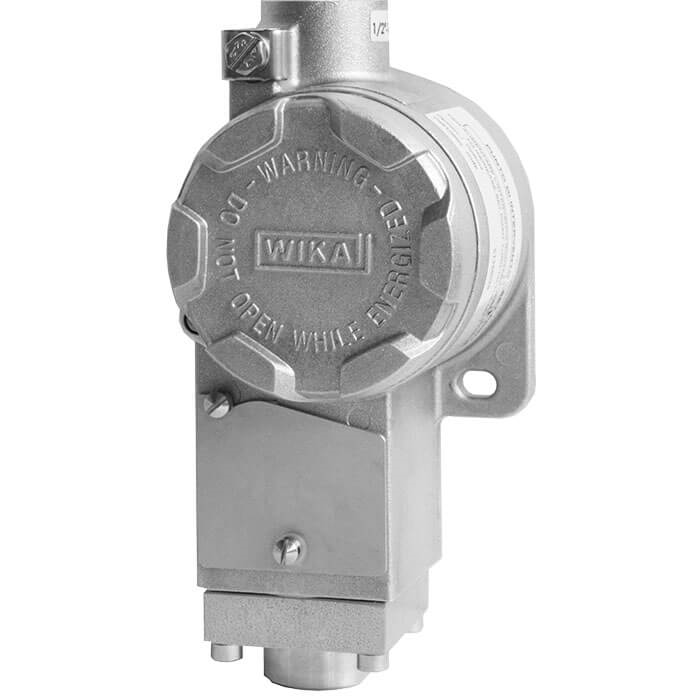 The high-quality mechanical pressure switches have been developed especially for safety-critical applications with limited space. The high quality of the products and manufacturing in accordance with ISO 9001 ensure reliable monitoring of your plant. In production, the mechanical pressure switches are traced by quality assurance software at every step and subsequently are 100 % tested. All wetted parts are from stainless steel as a standard. The switch enclosure is available in aluminium alloy or stainless steel. To adjust the set point simply open the access cover plate. This access can be sealed as an option. The access to the terminal block for the electrical connection is protected by a screw-on lid, which is secured with a screw-type lock against unauthorised intervention. The mechanical pressure switches are fitted with one micro switch, which enables the switching of an electrical load of up to AC 250 V, 15 A directly. For lower switching power ratings, such as for PLC applications, argon gas-filled micro switches with gold-plated contacts can be selected as an option. For two separate circuits the switches are also available in the version DPDT (double pole double throw). By using a diaphragm with antagonist spring as measuring element, the model PCA mechanical pressure switch is extremely robust and guarantees optimal operating characteristics. For medium and high setting ranges starting at 3 … 25 bar, a piston replaces or completes the diaphragm as a sensor element. The piston sensor element is designed for the specific requirements of liquid media.